A game that I initially tried because there was an iPhone app for it was Ingenious (and if you notice from the picture, I actually had the Travel Edition). Ingenious is an abstract spatial reasoning game. The game is played on a hexagonal shaped board in which players alternate placing pieces that are two hexes put together (like hex dominoes). After the first placement (in which players must place next to the symbols built into the board), the pieces can be placed anywhere on the board, but will primarily be placed next to other pieces with matching symbols. Once a piece is placed, you score points based on how many of the corresponding symbol are connected to the newly placed piece in each of the five lines beginning at the new tile (not going through the other half of the tile). If the newly placed tile causes the active player to score 18 in any of his colors, he can immediately place again. If not, he draws a new tile and then the other player takes his turn. Play goes on like this until no more tiles can be laid; at this point, whichever player has the highest number of points in his lowest scoring color/symbol is the winner (yes, it is by Reiner Knizia, in case you were wondering by this mechanic). Let's begin with the paragraph that is in each of my spatial reasoning reviews: I don't really know how to express what I like about these games. I think other people had this issue, too, which is why they termed these games "abstract". So, if the rest of this review seems more like "rambling" (even more than normal) than it does "concise thoughts", you'll just have to get over that. I really like how the placement of pieces works in the game. Especially because you can use pieces both offensively and defensively (and I imagine if I get better at the game, I'll be able to use them as both at the same time). You can use the pieces offensively by placing a color next to pre-existing tiles of the same color - this scores points and continuing the line of colors, but this also leaves it open for your opponent (or you on a future turn) to be able to score even more points. You can also play defensively by cutting off a long line of a single color by placing a different color at the end of it. However, then nobody will be able to score that line anymore. The ideal situation is to be able to place your tile in such a way as to be able to score the long line and then have the second half of your tile block off any future scoring of this line (preferably while scoring it's color, too). That would prevent your opponent from being able to easily earn points in one of the colors - which would then probably turn out to be his lowest scoring color. Another thing that I like about Ingenious is the "Ingenious bonus". This is where you get to place two tiles in a row if the first tile caused one of your colors to finally be 18 points (the highest score on a specific color). Having 18 points in a color doesn't really help you in the game - after all, if a color has it's maximum number of points, then it won't be your lowest, and so it won't be the one that scores. However, with the Ingenious bonus, it is just rewarding enough to tempt you into scoring extra in that color. If I have a color that is around 15, I will start looking to get the Ingenious bonus in order to be able to go again - I'm not convinced it helps me very much strategically, I just really like getting to go twice in a row. A final pro that I will mention is that I really like scoring based on your least valuable color. Whereas I have seen this mechanic in other games, it seems to work the best in Ingenious. Because of this mechanic, each player must make sure that they don't simply ignore one color. More specifically (since each tile only has two colors on it) they must make sure that they don't ignore one color for too long. You will probably not evenly place your colors throughout the game - you just have to make sure that as you place them you are planning ahead to where you will be able to score points on your other colors. And one thing that helps in this (that I haven't mentioned yet) is that if you don't have any tiles matching the color that you have the least points in, you can discard all of your tiles and draw six new ones at the end of your turn. This helps prevent the "score based on your lowest value" mechanic from causing you to lose simply because of what you draw. I can't really think of any specific cons for Ingenious. I enjoy the game, but not quite as much as some other spatial reasoning games. I think this is really when my inability to speak in a very intelligent manner about the genre comes into play. I like the game, but there is just something about it that I didn't like quite as much as some of the others; and that's why it won't get quite as good of a score. However, don't hear me saying that it's not a good game, because it definitely is. I'm sure that there's a lot more that I should say about the game, and that I'm not doing it justice by any means, but honestly I don't really have much more to add to this review. One thing that I will note is that I'm not a fan of the Travel Edition - I don't recommend buying it unless you actually intend to play it while traveling. The pieces are very small and it is a nuisance to try to pick them up. I didn't factor this into the score, though, since it is about the edition that I have and not about the game itself. Overall, I give Ingenious an 8.0/10. It is a very solid abstract spatial reasoning game that I will continue to play. 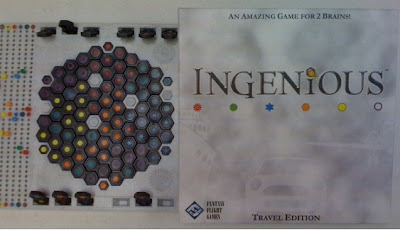 I still prefer Dvonn (which is growing on me more all the time), Yinsh, and Abalone, but Ingenious is a very solid title that I plan to continue playing for quite a while (though I did go ahead and replace my Travel Edition with the full-sized version). 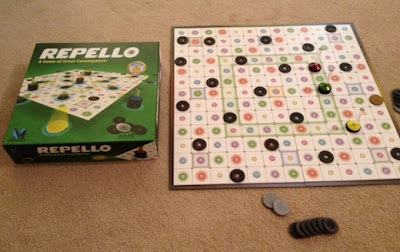 Another intriguing looking game by Mindtwister USA (makers of the fabulous game of Pentago) that I had the opportunity to play was Repello (which for some reason they don't seem to sell through Amazon). In Repello (the first game I've played by Mindtwister that doesn't involve twisting the board) the object of the game is to score points by knocking pieces off of the board. This is possible because every piece "repels" every other piece - but you (as the active player) get to choose which piece gets repelled, and which piece stays. To start your turn, you move your piece one space in any direction (and leave behind a round black disc from your pogo-stick looking marker). Each square on the board has a number on it, and after your initial single-space movement, you continue moving by this many more spaces. If you run into a wall, then you "bounce" back in the opposite direction (or at a 45 degree angle if you come at it diagonally). After your move is completed, you must check to see if any two pieces on the board are adjacent to each other. If so, you must move one of them directly backwards from the piece it is adjacent to - if there are several pieces adjacent to each other, you choose the order that the "repelling" occurs in. After this initial "repelling", you again check for adjacent pieces, and you continue this process until the board is in a "resolved" state (no two pieces are adjacent) - this repelling is how you knock pieces off (to score points). Play continues in this manner until each player's pogo-stick marker is out of black discs. At that point, the game is over, and players score points for each of their discs. The first pro to Repello is that it is incredibly chaotic. 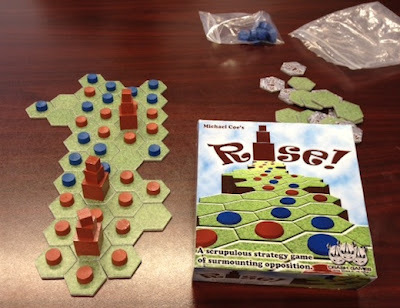 The game starts off (and can end) a bit slowly, but there is a peak in the middle of the game where a player will push pieces all across the board. Since each turn adds another disc to the board, the game is setup so that there will be adjacent pieces at some point. And after several of these pieces have been left behind (and before too many of them have been knocked back off) there will be some turns in which a player may wind up moving 10 or more pieces. These turns are great, and they are really where some players start to get a major point advantage in the game. This is also the most fun part about the game - "I'm going to move here and see what happens..." <five minutes later> "Ok, I'm done!" (after scoring 5 points). The next pro to Repello is that it is really kid friendly. I can see people of any age playing the game, as the rules are simple enough to teach to kids (I would guess) as young as 6-8. What's more, kids may actually have more fun than adults with this game, as I could see them just enjoying the actual playing of the game, and so they would play it quickly (see the con below for how it works with adults). The final pro that I will mention is one that I was the victim of the first time I played - you can knock off other players. Specifically, when you knock off other players, you get to steal a disc from their pogo-stick, and you also get to steal a disc that they had previously collected (such as that gold disc worth 5 points). This adds to both the fun and the strategy of the game; the fun because most people will enjoy knocking their opponent off, and the strategy because once you have collected valuable discs you need to make sure that your opponent cannot knock you off. However, after you are knocked off, you get to return to the board in one of the "green" (starting) tiles - and then you get to resolve all conflicts before making your move. This essentially gives you two opportunities to knock things off of the board! So, whereas it is not good to be knocked off (you lose a turn and a disc), you can really gain quite a few points when you come back on the board. The next con is that the rules are not quite as clear as I would like in a few instances. For example, I'm still not entirely sure what all the rules are when a player runs out of discs on his piece. If, for example, one unfortunate player (me) has been knocked off the board several times, does his turn get skipped once he is out of pieces to leave behind? What about if he gets knocked off the board - does he get to come back on the board? I believe that the instructions do talk about these things, but it wasn't in clear enough language that we were confident that we were playing it completely correctly. Overall, I give Repello a 7.5/10. I thought that it was fun, unique, and interesting. However, the Analysis Paralysis can cause this "30+ minute" game to take an hour and a half or more when I play it, and I think that this causes the game to drag a bit more than I would like. If you like spatial reasoning games, this is definitely one that you should consider - and if you have kids that like chaotic games, this can deliver there as well. I would like to thank Mindtwister USA for providing me with a review copy of Repello. One of my very first reviews (I believe it was actually my second overall review) was of Castle Ravenloft. I enjoyed the game, but felt like it had limited replayability. 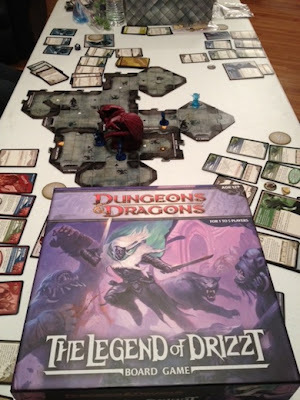 Now that Wizards of the Coast has made two more Dungeons & Dragons titles, I was willing to try again - this time with Legend of Drizzt. In Legend of Drizzt (just like in Castle Ravenloft), you are playing Dungeons and Dragons as a board game. This means that the scenarios and monsters are preset, but it gives you the opportunity to play with all of your friends without any of them having to run the game as the GM. 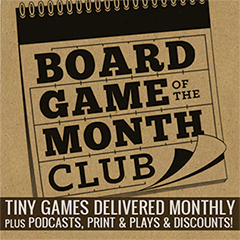 Each player takes on the role of a hero and the players collectively attempt to accomplish the goal of the scenario (beat the big dragon, recover the treasure - you know, something heroic). 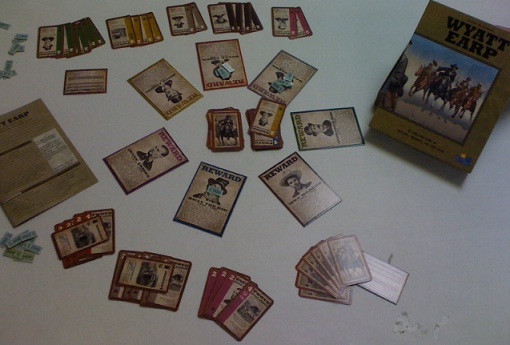 Each turn, the players are able to move twice, or move and attack (or attack and then move). After doing this, if they are adjacent to an unexplored edge of the board, they can reveal a new dungeon tile (and a monster). If they don't explore, then they have an encounter (which never ends well, especially if you are near volcanic vents). Finally, the active player must move all of the monsters that he controls. Play continues like this until one of the heroes has died or until the heroes have accomplished their mission. The first thing that I like about Legend of Drizzt is the same thing that attracted me initially to Castle Ravenloft - I enjoy that I am able to take part in a nice role-playing adventure without all of the setup time. Compared to a normal campaign of Dungeons and Dragons, you can very quickly start (and play) a game of Drizzt. And yet, though the game is brief compared to a normal campaign, the scenarios are very well done and I did not feel like the lack of a GM made the game any less enjoyable. The next thing that I like about Drizzt is that you can customize your character, and that there are several characters to choose from - including some characters that are villains in some scenarios and heroes in others (I thought that this was a nice touch). There are significantly more heroes than players allowed in a game, which means that if you play the game repeatedly, you can use different characters each time. In addition, you are able to customize the attacks and "powers" that your character has each game, which allows you to even play the same character differently and tailor him to the scenario that you are playing. A third pro that I think is interesting about Legend of Drizzt is how monster control works. On a player's turn, he controls all of the monsters that he has revealed on previous turns. However, so that you don't have to keep track of which instance of a given monster each player revealed, if there are several copies of a monster on the board (such as a Spider Swarm), the player controlling that monster will have to activate each copy of it on the board. So, if you are not paying attention to some of the smaller monsters, you must be careful that you don't allow too many copies of them out on the table, or else they will start activating very quickly! Whereas this is a fairly minor rule, I thought that it was a nice touch to the game. The final pro that I will mention about Drizzt relates to the replayability issue that I had in Castle Ravenloft - I really like that they have added different kinds of scenarios. Now, instead of each scenario being strictly cooperative, some scenarios are team based, some are cooperative, and some are even competitive! The monsters that are encountered are still the same, but these different scenario types completely change the strategy with which you play the game - thus allowing the playing experience to stay a bit more fresh. However, with that said, I still felt that the replayability of the game was a bit lacking. My biggest problem with Drizzt was that you are experiencing the same encounters and monsters every time through the game. Yes, there will be some games where you don't encounter one specific type of monster, but in essentially every game that we played, we ran into the same Feral Troll, Spider Swarm, and Hunting Drake. The scenarios are nice, and I do honestly like them, but the problem is that every scenario involves fighting through the same handful of monsters until you either die or get to whatever aspect of the scenario sets it apart from all of the others. Either way, 75% of the game deals with fighting the same grunts as in every other scenario. The only other real con that I had for Drizzt was the opposite of the first pro that I mentioned. I really like that you can quickly pick up and play a short scenario of Dungeons and Dragons - but the cost in terms of gameplay is that your character will not really develop very much. None of the heroes are able to level up beyond level 2 (and often don't even get that far). This means that you won't have the satisfaction of the character truly becoming "yours." He will still feel like the out of the box character that he was at the beginning of the game. Overall, I give Legend of Drizzt a 7.0/10. Adding the different kinds of scenarios helped address my largest problem with Ravenloft, and so it helped my score to go up a full point over what I gave to Castle Ravenloft! If you enjoyed the previous games in this series, then I fully believe that you will enjoy Drizzt as well. 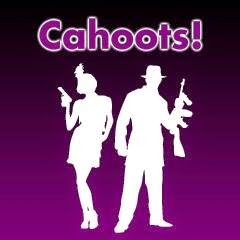 If you have been curious about the series, then I would recommend that you play them - they are definitely worth playing! I would simply recommend that (if possible) you play them a couple times before deciding whether you want to invest the money into purchasing your own copy. 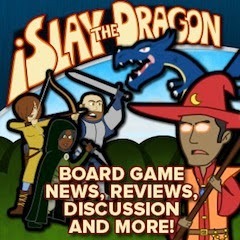 For a second take, check out this Review of Legend of Drizzt on Play Board Games. And, if Legend of Drizzt sounds interesting, you might also want to check out Talisman Revised 4th Edition, Mage Wars, and Game of Thrones Living Card Game. I would like to thank Wizards of the Coast for providing me with a review copy of Legend of Drizzt. A game that I had never heard of was called "Jin Li". Then, a tornado blew up my house and lots of people sent me games. One of those people, David MacKenzie of Clever Mojo Games, sent me Jin Li. As I was looking for a new game to play, I asked myself "hey, what's that weird little game in the canvas zipper?" And thus... I found friendly fish. In fact, the fish in Jin Li are so friendly that they want to touch each other (not in the dirty way, pervert - these are good, wholesome fish!). Instead, they just like being near the other fish. Because of this, they will reward you with their form of currency called "victory points" if you are able to get them adjacent to each other. Specifically, each turn you can move one of your fish and place a stone, or you can jump over a stone. You cannot jump over more than one stone or another fish. We call those things "cheating". However, if, after moving your fish, it is adjacent to other fish, then you score one point for each fish that is adjacent to the fish you just moved. Keep doing this until one person gets enough "victory points" to escape the fishbowl. Wait, these fish like each other... they don't want to escape. Oh well, the game is played to ten anyway. The first thing that I like about Jin Li is that you only score on the fish that was just moved. If this weren't the case, I think that the game would be broken. After all, if your opponent moves his fish next to you, then at the end of the next turn you are still next to him. However, since it is only the fish that was just moved, you have to find a way to move and still be adjacent to the other fish. And there might be pesky stones in your way. The second thing I like about Jin Li is the pesky stones that might be in your way. If it weren't for the placing of the stones, the fish would easily swim next to each other in peace and bliss forever (though you would punish them by leaving them in the game box (canvas zipper), since the game wouldn't be any fun). The stones, however, are the key element in thwarting what your opponent (and his fish) want to do. Stones can be used to both help your fish move more quickly (if a single stone is in front of you) and to block your opponent from moving (if multiple stones are in front of him). The stones combined with fish placement and the fact that you cannot jump over an opponent's fish all combine to make for an impressively strategic game with ridiculously simple instructions. 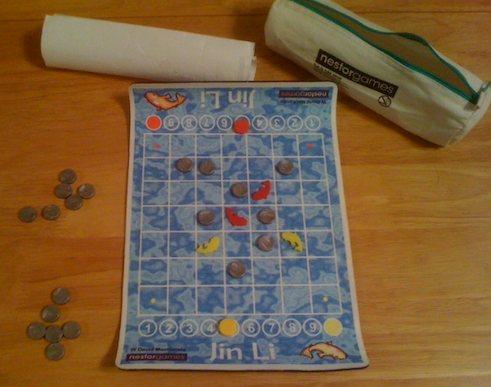 The main "con" to Jin Li is that it is a filler game. I won't ever go meet up with any of my friends simply to play Jin Li. I used to live 5 minutes away from the game store where I played most of my games; it would take about as long to get to the store as it would to play through a game of Jin Li. I really enjoy the game, but it is by all of my definitions a filler game that I will play in between longer games. The nit-picky con to Jin Li is that the "board" (which appears to be a mousepad with the playing area screen-printed on it) does not like to lay flat. Neither do the instructions. I think that this is because they spend most of their life rolled up inside the canvas zipper. Right, the instructions all fit on a single page. So I should stop before my review of the game winds up being significantly longer than the instructions. Overall, I give Jin Li an 8.5/10. 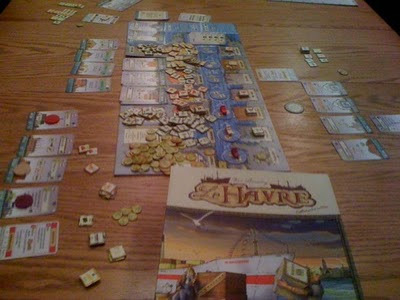 It is a very nice little strategy game that is a great way of passing time when waiting for other games to be played. I would recommend that everyone go out and buy it but, unfortunately, it is not easily (cheaply) available in the United States. It is (as far as I know) only printed in Spain through Nestor Games. However, there is an iPod/iPad/iPhone version available for $0.99. I bought it and I have really enjoyed it - I would recommend you check it out as well. Like abstract games? 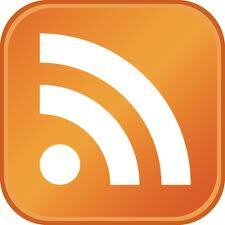 You might also read my reviews of Abalone, Dvonn, Pentago, and Rise. I would like to thank David MacKenzie of Clever Mojo Games for sending me a copy of Jin Li along with several boxes of other games from his personal collection to help rebuild my collection and to give to the people of Joplin after the tornado. Thanks, David! 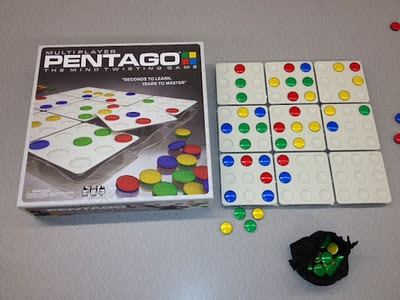 So, as those of you who have followed my site for a while know, I really enjoyed playing Pentago (see my review here). Because of this, I was quite intrigued about Multiplayer Pentago. Multiplayer Pentago is the same as Pentago - play one, spin one, try to get five in a row. 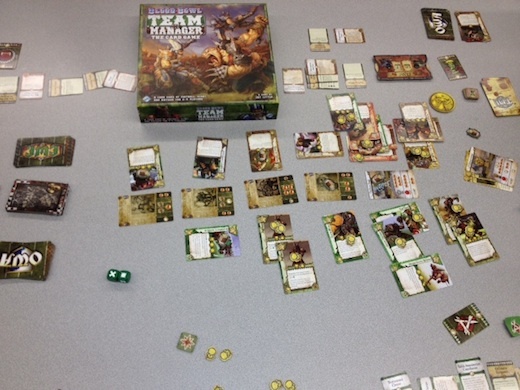 However, instead of only being two player, it can be played with up to four players (or on two teams of two). In addition, instead of only having a 2x2 grid, now the gameboard is a 3x3 grid - adding 5 new sections that can spin. Now that you know the game, I'm not going to really re-iterate the pros and cons, because they're really the same as in the original. Instead, I'll discuss the differences with the basic game of Pentago to give you a better feel of which one you might prefer. First, Multiplayer Pentago gives you more ways to win. In the original game, you could be sneaky. So sneaky, in fact, that your five in a row could be spread out across three different tiles. However, if you're that sneaky player in Multiplayer Pentago, you can spread it across four tiles! Plus, the simple middle lines can now spread across three different tiles, making a three in a row on any given tile much more dangerous - it can now be expanded in either direction. Next, you have the simple fact that you can play the game with more people. I like this feature, and I've enjoyed playing with both three and four players. Three players has an interesting dynamic in which, if one player is leading, the other players can both stop him. Instead of being only one "spin" away, two players can easily join forces to spin the other player's pieces in the wrong direction. However, you can also get caught in a situation where one player keeps blocking the player in front of him - just to let the third player's strategy go undefended (this is the player that gets to win). Four player's dynamics feel more like the basic game, but you have to watch out for so many more connections! When defending, though, you have help - if you don't see a five in a row coming, some of the other players might (or they might all be fooled! This happens too). Overall, I give Multiplayer Pentago an 8.5/10. It's Pentago - with more options. I still don't think that people will get together just to play it (hence the 8.5 instead of 9.0), but I think that when people get together and start playing Multiplayer Pentago, they will enjoy it. And now, they'll feel less exclusive while doing so! Now that all six installments of the "Shadows of Mirkwood" expansion to Lord of the Rings: The Card Game have been released, I figured it was time for me to write a combined review. 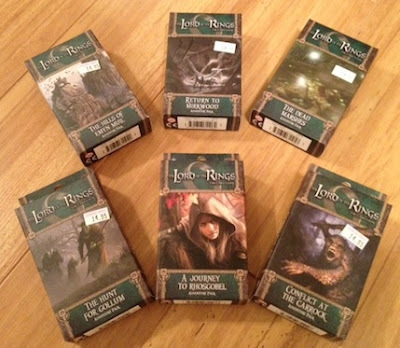 This review will cover all six expansions, which include: The Hunt for Gollum, Conflict at the Carrock, A Journey to Rhosgobel, The Hills of Emyn Muil, The Dead Marshes, and Return to Mirkwood. Since this review is of an expansion, I am going to assume that you are familiar with the basics of Lord of the Rings: The Card Game, and if not, feel free to check out my review of it here. Also, since I've already covered the pros and cons of the basic game, this review will focus more on themes of the expansion set. Isn't this the real reason that you're interested in buying expansions? You're curious who Fantasy Flight is going to come up with? Well, here's a cheat sheet of the heroes that were released in this wave (in the order that I find them in my box, not in the order they were released): Bilbo Baggins (green), Prince Imrahil (purple), Dain Ironfoot (purple), Frodo Baggins (blue), Boromir (red), and Brand son of Bain (red). So, here's the next important question with heroes - are they worth using? Actually, I found this to be a surprising "yes." Like with most cards in the game (other than Gandalf), it really depends on what kind of deck you're building and what scenario you are playing. For example, one of my favorite decks is a Green/Purple deck that allows me to draw a lot of cards and then have the resources to play them. Biblo fits in quite nicely in this deck (his ability allows the first player to draw an extra card) - unless there are lots of bad treacheries and fighting, because he only has two hit points. I also really like that Fantasy Flight was able to add heroes that I was unfamiliar with. 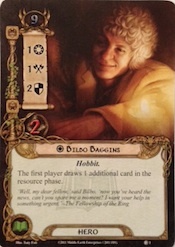 When I opened the first couple of packs from this expansion, I received Bilbo and Frodo Baggins. I thought to myself, "Gee, I guess this is the hobbit wave - here come Sam, Merry, and Pippin." But, then, I was pleasantly surprised with people that I was unfamiliar with. This means that Fantasy Flight is investing a lot of time into the lore of Middle Earth (or making things up and tricking me). Either way, it means that they have a lot of ideas and plan to keep this game fresh. Do you have an obsessive need to have the best possible deck? To fill this need, do you have to buy all the new cards when they come out? Were you as annoyed as me when the base set did not contain three copies of each card, thus forcing you to buy several copies of the base game to build the deck that you really wanted? Then rejoice!! Fantasy Flight fixed my biggest complaint about this game! 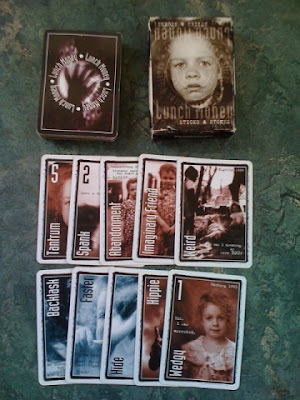 Each of the expansions contains three copies of each card that can be used for deck construction - a full "play set." This means that you only have to buy one copy of each pack, and you can build whatever deck you want! With that stated, there were a few overall themes in these sets. Songs are the cards that allow you to build better cross-colored decks. They each require a neutral resource, and there are four different types - corresponding to the different colors. Each song can be played on a hero, and it gives that hero another resource symbol - suddenly your Purple hero's resources can be used for Purple and Green (or whatever other color, depending on the song you play). These were critical cards, and I'm glad that they released them in the first expansion instead of waiting on them. This wave really focused on the Red cards being Eagle related. There are several Eagles released - both unique and non-unique, and there are also many cards that work well with the Eagles (cards that let you search the top of your deck for Eagle cards, etc). Whereas I was quite hesitant about the Eagles when the wave started, by the end of it enough Eagle cards had been released that I feel like a solid Eagle-themed deck could be built. Also, there are several good Eagle cards (like Landroval) that can be used to improve a Red deck regardless of whether it is Eagle themed. 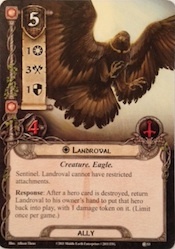 My favorite Eagle cards are Landroval and Radagast (who isn't actually an Eagle). They're both expensive, but they're both worth the cost. Landroval is able to save a hero as it is destroyed (I believe this is the only effect currently available in the game that allows this). Radagast collects resources like a hero, but his resources can only be used to pay for "Creature" (currently Eagle) cards. These cards are both incredibly useful, and I can see them being used a lot through the rest of the expansions. The theme around many of the new Blue cards was Rohan. Similar to the Eagles, Blue gained more and more cards that were either Rohan characters or that supported Rohan cards. I'm not convinced that there is quite enough power behind the Rohan cards that are currently released to make an effective Rohan themed deck, but I must confess that I haven't tried. I have spent most of this wave enamored with my Purple/Green deck (Steward of Gondor is, by far, my favorite card; I also love the Sneak Attack/Gandalf combination), so I will leave off the discussion of Rohan for someone more qualified. If we only ever had the basic three adventures, this game sure would get boring, wouldn't it? Not to mention, it would be simple to build a deck that could win consistently, especially with all the new heroes and deck cards. Fortunately, each new set came with a new adventure. The concept behind this scenario is that you are searching for clues to find Gollum. This really fleshes out the Objective cards that are only used in the base game in the hard scenario. Throughout the scenario, you will need to find various Clues about where Gollum has been hiding. If you don't find Clues, then you will not be able to quest in the last stage of the adventure. And yet, the more Clues you expose, the harder the enemies become. I like this scenario, and I think it is surprisingly challenging. For whatever reason, however, it seems the most fiddly to me. I have played it around 5-7 times, and I hardly ever remember to do each little card action ("at the start of the quest phase...", "after successfully questing...", etc). Do you like fighting? Then this scenario is for you! Honestly, this is the scenario that I have played the least, because it seems like it works best with multiple players (and I have played the game a decent amount two or three players, but much of my gameplay has been solo). You start the game with four names Trolls just waiting to puch you in the face once you get to the second phase of the quest. What's worse, in the first phase of the quest the treacheries are absolutely atrocious! Your heroes can become "Sacked!" which makes them completely useless... and can instantly kill them if a certain other treachery comes out. This is definitely the hardest scenario of the six, but it is quite rewarding if you win. The key (from what I've seen) is to get to the second quest phase quickly, keep your threat down, and kill the Trolls off one at a time. This could also be known as the "Quest to Save Wilyador." The goal of this scenario is to protect and heal Wilyador (an Eagle). This I think is the most creative, and possibly most enjoyable, scenario of all the ones I have played. Eagles and Ranged characters are crucial, as many enemies will only be able to be blocked by characters with these traits. 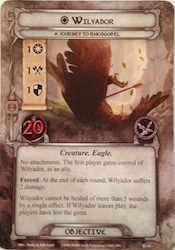 To put you on the clock, however, Wilyador receives two wounds at the end of each turn. Fortunately, there are Objective cards that can be used at the end of the game to heal Wilyador by five wounds each. I recommend that you have some other cards (Green) that can help his healing process along as well, because if you do not completely heal him at the end of the game, then you will lose. I have heard more complaints online about this scenario that any of the others. This is a single quest phase scenario (that requires only 1 quest point on that phase), but you must have 20 victory points and no Emyn Muil locations in play in order to win. This scenario is really fairly simple (it is mostly questing and traveling to locations), especially if you have the Northern Tracker (or several of them) in play. I will agree that this is probably the least enjoyable scenario to play, but I wasn't really disappointed with it. I am glad that there is a different flavor to each scenario. Ah, Gollum. This is his first appearance. Specifically, you have captured Gollum, and he is doing his best to escape. This introduces a new concept called the "Escape Test." Every so often, Gollum will attempt to escape, and you will be forced to attempt an Escape Test to see how successful he is. These work similarly to questing, but certain cards will have "Escape: X" on them instead of using the Threat amount on a card. If Gollum does ever escape, then he shuffles back into the Encounter Deck. And then the game goes on until you can find him again! (I don't recommend letting him escape.) This really is an interesting new feature to the game, and I like it theoretically. Unfortunately, I get bored when games force you to draw a card that is shuffled somewhere in a draw pile in order to win. So, when Gollum escaped from me, I did eventually win, but I was somewhat bored by the time he finally came up. Welcome back, Gollum! This time you have (somehow) broken Gollum's spirit, and you are dragging him along with you. Unfortunately, you have to keep Gollum alive, which means committing a player to Guard him. This person is too close to Gollum, and needs to be careful not to listen closely to him - and this is represented by having his Threat raised by three instead of one at the end of each turn. 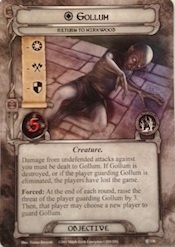 There are also a lot of Treachery cards and Shadow effects that try to harm (and kill off) the player guarding Gollum. This was another one that I enjoyed, and overall I was quite happy that each of these scenarios really had a different feel to them. Overall, I give the Shadows of Mirkwood expansion a 9.0/10. I was quite happy with them, and I really felt like they expanded every aspect of a game that I already loved. If Fantasy Flight keeps this up, I can see myself continuing to play this game for quite some time. 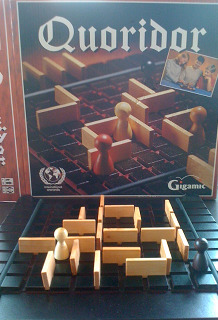 In Quoridor, each player controls a pawn that they are attempting to move to the opposite side of the board. They also control a certain number of "fences" that they use to block their opponent(s) from moving their own pawns across the board. Each turn a player can either move his pawn or place a fence. The only real rule about fence placement is that you must always leave a path for your opponent(s) to be able to reach his goal. The first thing that I like about Quoridor is that a good player (I'm not one) can use his fences for both offense and defense. One way is pretty obvious - put fences in front of your opponent. However, once you become good at the game, you will be able to use your fences to protect yourself as well. There are very few rules, but one is critical - a path cannot be completely blocked off. Therefore, if you are smart with your fences, you are able to play your fences so that your opponent cannot play their fence as effectively as they would like. You do this by playing your fence so that if your opponent plays theirs in response it will completely block off the path. I wish that I were better at using my fence both ways, but, even though I'm not good at using mine like this, I like this aspect of the game. Since my person rule is to try to not write a review longer than the rules, it's time for me to mention a con (and then stop writing - the rules are really short). The game can quickly turn into a race. Once all of the fences are placed, all that is left is to see who can get to the other side faster. This isn't a huge drawback, since the strategy is mostly in placing the fences, but it is somewhat anti-climactic once all of the fences are placed to just alternate moving pawns back and forth. Overall, I give Quoridor a 7.5/10. It's not the greatest spatial reasoning game that I've ever played, but it is worth playing. If you like mazes and such, this is definitely a game that would be worth checking out. I hope you're not too disappointed with the short review! If Quoridor sounds like your kind of game, you might also want to check out Gipf, Brandubh, and Ingenious. After absolutely falling in love with Pentago, I was interested in checking out other games by Mindtwister. Because of this, I asked to try out Quadrago. 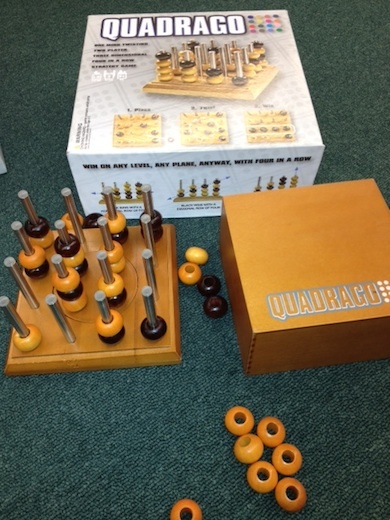 In Quadrago, the goal is to get four pieces in a row. You are playing inside of a 4x4x4 cube which can spin in the middle. Each turn, you place a piece on one of the rods. Then, optionally, you may spin the middle 2x2 section 90 degrees (one "notch"). The first player to get four pieces in a row first - vertically, horizontally, diagonally, or a combination of these - is the winner. The first thing that I like about Quadrago is that it is a gorgeous game. Not only are the pieces high quality, but the game also comes with a "box inside the box." Inside of the standard cardboard box is a wooden box which actually contains everything needed to play and could easily be set out on a coffee table or work desk. This is a wonderful game if you are someone who likes to place high quality wooden games around your home for decoration. And at the same time, the game is enjoyable and strategic - which helps quite a bit when a friend comes over and asks, "What's this?" You never want to have to answer with, "That's a game. It's called [I'm omitting the name here, but you know who you are, you crummy little game]. Let's not play it." Third, I like the twisting element in the middle of the game. It isn't really as prevalent as in Pentago - I believe this is related to the twist being optional. However, it does add a new strategy to the game; more hiding what you're intending than winning through the careful twisting of the sections. Since there is only one twist-able section, and for the most part it can be placed where it needs to be in a single turn, the twisting seemed mostly like a hiding element. Though I enjoy Quadrago, my main con is that most of the games seem to end in "Oh." Not, "Oh!" or "Ahhh!" Just "Oh." It seems like most of the games that we play end in someone simply not seeing something very basic that is right in front of their face. 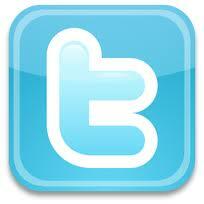 The three dimensional aspect of the game is a double-edged attribute. Whereas it really adds to the depth and enjoyment of the game, it also obfuscates (how's that for a five-cent word) the gameplay enough that it is simply hard to see what's going on. Most of the games that I have played have not ended in placing a piece and then twisting everything into place to win or trapping your opponent so that you can win no matter where they place. Most of the time they just end in someone placing the fourth one in an obvious straight line and their opponent didn't see it because of the pieces stacked everywhere. Overall, I give Quadrago a 7.5/10. I debated giving it a bit higher, but I don't think that it has quite the addictiveness to it that Pentago does. I think this is because Pentago often ends in "Ahhhh!!!" whereas Quadrago often ends in "Oh." If you like beautiful games, "in a row" games, or are looking for a new game to play with your kids, it is definitely worth checking out - I think that there are people that will absolutely love Quadrago (people who are good at seeing everything going on in the game). But, whereas I think that everyone should play Pentago at some point in their life, I don't think that Quadrago will be a great fit with everyone. I would like to thank Mindtwister USA for providing me with a review copy of Quadrago.